I first became intrigued with the story of the Great American Dust Bowl after the History Channe l premiered its production of “Black Blizzards.” This special documented the harrowing account of the dust storms that ravaged America’s heartland in the 1930s by weather phenomenon known, needless to say, as “black blizzards.” These frightening storms were far more menacing than any weather event Americans had before encountered. Hurricanes were limited to coastal regions lasting only a few hours; tornadoes were sporadic but could be eluded by going underground; the effects of snow could be abated with shelter and fire, but no one or nothing could escape the wrath of black blizzards. Dust clouds boiled up, tens of thousands of feet in the sky and rolled along with inimitable ferocity sweeping across the nation, blotting out the sun along the way until the mountain of black earth at times stretched across the heartland of North America all the way to the Atlantic Ocean. Nothing was spared from the black blizzards. 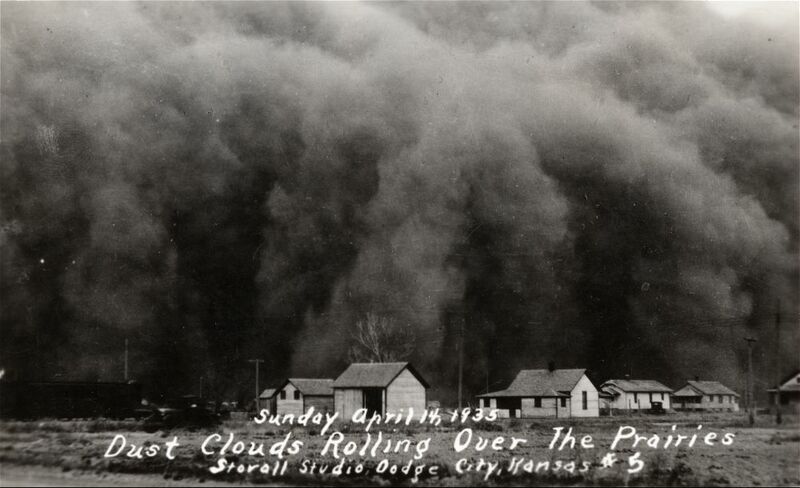 At its peak, the Dust Bowl covered more than one hundred million acres across parts of New Mexico, Texas, Colorado, Oklahoma, Kansas and Nebraska. American meteorologists rank the black blizzards of the 1930s the single greatest weather assault in the history of the land. And for those who survived it is truly a testimony to their unshakable resolve. We would all do well to take a lesson from their lives. For me, the stories of the farmers who survived the nation’s greatest environmental disaster bring to mind the sobering reality of just how much the Lord has blessed this generation. We do not live in a world in which the air we breathe could precipitate our demise, nor are forced to eat tumbleweed to subsist. We live in a nation that God has blessed immensely, one in which, for the majority, our greatest conundrums entail deciding between which reality television show to watch or which apps to download to our smartphones. We, for the most part, have little idea what it means to suffer. Really suffer. So, just to help me remember how blessed we are, I keep the above picture as my screensaver to remind me of all the Lord’s blessings—which I all too often take for granted. Each time I log onto my computer I am compelled to remember I serve a God who, despite our greatest efforts to suppress the truth of His existence and deny Him the glory He rightly deserves, never ceases to bestow blessings. Whenever I feel like murmuring or complaining I just look at that picture of those who have experienced true suffering and deprivation and am reminded of the dark tendencies of my own heart.